Take avocado and spoon into a small bowl. Then add in mustard, apple cider vinegar, and black pepper and sea salt. Place broccoli and celery into large bowl. 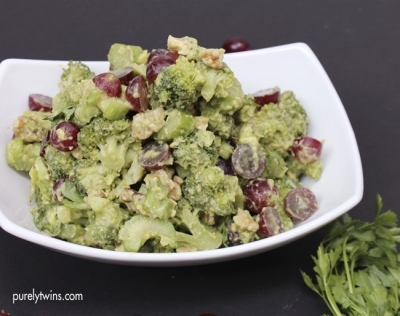 Pour avocado dressing over broccoli and celery and toss together. Add in red grapes and walnuts with parley. Add in chicken or turkey for some protein!